(CNN) -- More than 600 people remained missing Wednesday in one of two Brazilian states where heavy rain has led to 45 deaths and left thousands of residents homeless, officials said. Flooding from heavy rain that started late last week has damaged large segments of Alagoas and Pernambuco states in coastal northeastern Brazil. The death toll had not increased Wednesday from the previous day's tally -- 29 in Alagoas and 16 in Pernambuco, civil defense officials said. The worst damage has occurred in Alagoas, where nearly 20,000 homes have been damaged or destroyed, the state civil defense office said. Video from CNN affiliate Record TV shows rivers of water rushing through city streets that have turned into roiling canals. Some people clamber on rooftops while others watch helplessly from second-floor windows. One scene shows a woman trying to cross a street by holding onto a rope suspended about a foot above the water, the strong current pushing her head underneath at one point before she emerges again and reaches helping hands on the other side. 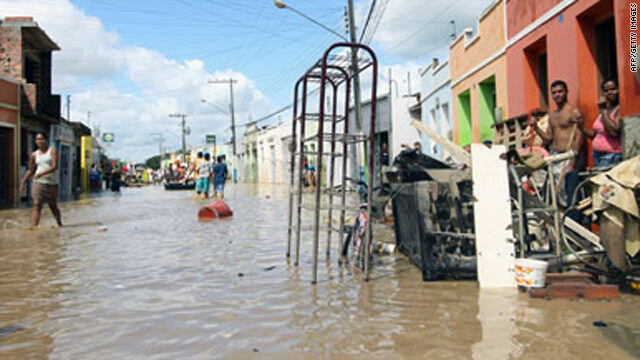 Nearly 74,000 people are homeless or displaced in Alagoas, the civil defense said Wednesday. 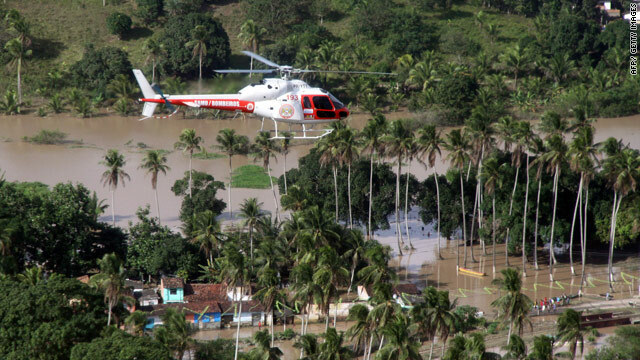 More than 830 people were injured or ill in Alagoas, the state office said. In neighboring Pernambuco, more than 42,000 people had been left homeless or displaced, national civil defense officials said Wednesday. Brazilian President Luiz Inacio Lula da Silva is scheduled to tour the damaged areas Thursday. The federal government has pledged more than $150 million to help with reconstruction. Half of the money is supposed to go directly to the victims. Defense Minister Nelson Jobim and Marcia Lopes, social development ministry chief, flew over flooded parts of Alagoas on Tuesday, accompanied by Gov. Teotonio Vilela Filho. Lopes said she was shocked by what she saw. "It is an overwhelming disaster," she said. "We have to come together and help these people." The governor has declared a public calamity in more than 30 municipalities. Jobim was scheduled to fly over Pernambuco on Wednesday, viewing the damage at some of the 39 municipalities that have been declared a disaster.